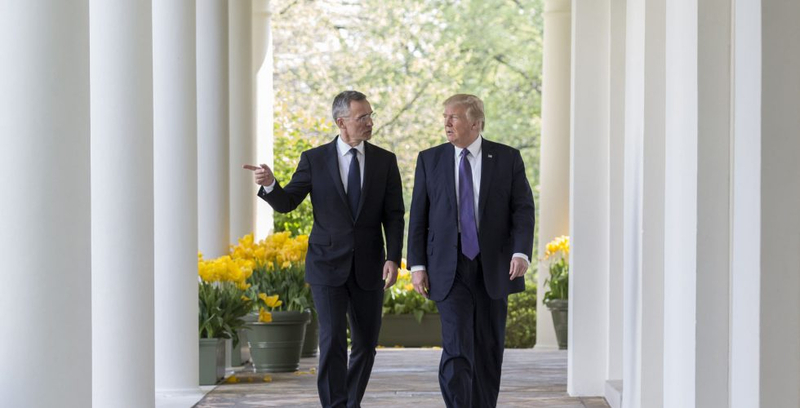 For nearly two years NATO friends like Jim Mattis have papered over the shift in transatlantic relations. When the curtain goes up for the next act, Europe needs a better understanding of the United States as it really is. Trump has now taken control of foreign policy. There is much to be said about this, but from a small, NATO-dependent country, it can also be reduced to the following: Europe has ignored the needs of the Americans and divorce threatens. Trump is not an unpredictable maniac. His long-held contempt for Europe and alliances characterizes US politics more and more. The old guard at the top was largely outmaneuvered in 2018. Trump loyalists Mike Pompeo, John Bolton and Larry Kudlow are in charge now. The Trump doctrine is in operation: a pronounced transactional and short-term perspective on intergovernmental relations. Unilateralism at the expense of multilateralism. Authoritarian governments rather than democracies. Trade policy is mercantilistic. Human rights and the rule of law are not respected. A two-term Trump presidency is quite possible. European rolling of eyes is not a strategy. The populist wave in the United States is a result of US war fatigue and lack of growth for most people. Russian hybrid warfare utilizes only existing conflict lines. Political entrepreneurs like Trump exploit conflict lines for their own short-term gain. Populist trouble in the US must be expected from time to time. We were caught unawares by Trump's victory. Groupthink is dangerous. Where was the analysis, the warnings? Do we understand the Americans, or are we the deaf husband who is surprised by divorce papers? I wrote in July 2016 about "Prepare for Trump", but no one would publish it. The Norwegian foreign policy establishment only weakly alerted the public. The public is therefore poorly prepared for a necessary commitment to defense and transatlantic relations. Burden sharing is the trigger for the crisis. Defense expenditure is the Achilles heel in transatlantic relations. The goal of two percent of GDP expenditure for defence is perhaps a poor professional military goal, but a political acid test. The American elite and general public are tired of bearing the defence burden. Europe must show a strong will to defend itself. Trump is just the opportunist who stands ready to strike. The next president will not have political space to subsidize Europe. To put it bluntly: Either we get to two percent fast, or much more shortly thereafter. Russia leans hard on the weak. In the longer term, we must have open ears to avoid a repeat of 2016 and be responsive. We must have a broader network of contacts in the United States, not just our ideological best friends. Traditional relationship building must be reinforced and supplemented. The Americans have a rich ecosystem of opinion-forming institutions. I myself have been at a think tank in Washington. Ideas mature and are quality controlled before some eventually becomes state policy. We may not always like American ideas, but there is a method to the madness. Here we can get your finger on the pulse. Early career contacts with upcoming stars are valuable. We already have some fingers in the pie - for example the Ministry of Foreign Affairs supports the New America Foundation which is in our sweet spot. But more needs to be done. A Nordic capacity for analysis, contact and influence must be built with our most important ally. Why not a Nordic think tank? Smart Nordic and Estonian diplomats have started "Nordic West Office" - a joint Nordic think tank in Washington. Swedish, Finnish and Estonian businesses are heavily involved. This is just the right spot for Norwegian business and foreign policy. Together, we can create a Nordic understanding of American opinion-forming processes. PR is also an underutilized opportunity. The Nordic model can be popularized. If the Russians can influence American opinion on social media, why can't we? Small change in preventive PR are worth many times the effort. The old Norwegian-American newspaper Nordisk tidende, now The Norwegian American survives on crumbs - where is the support? An extended and successful Nordic region is marketable in the US, and a natural block in the EU and NATO. Only when our neighbors are safe are we safe. To secure Sweden, Finland must be secure. In order to secure Finland, Estonia and the Baltic countries must be secure. Estonia must become fully Nordic. Circles of dependency bind small states, and help the EU against trouble on the flanks. The Americans can and must be handled. We must meet their main defense requirements. Then, with a deeper understanding of the Americans, we can effectively contribute to transatlantic unity. We have a hopeful Nordic message that is easily sold.